Holly’s practice focuses on commercial real estate development and finance. She represents clients on a range of sophisticated and complex real estate transactions, including multi-state acquisitions and dispositions, mixed-use developments, real estate portfolio transactions, master leases, sale-leasebacks and ground leases, private equity funding and secured lending. She maintains a focus in an active capital markets and fund practice, representing investors in joint venture transactions and sophisticated fund structures. Her work touches on a comprehensive array of real estate asset types, including office, multifamily, senior living and healthcare-related properties, mixed-use and low-income housing. Holly represents real estate developers, commercial lending institutions and syndicators in real estate financing transactions, including acquisition, construction and permanent financing of office, retail, hotel, manufactured housing and multi-family projects throughout the United States. Her real estate finance practice also includes substantial work on tax credit financing transactions involving low-income housing tax credits, historic rehabilitation tax credits and New Markets Tax Credits. Taking a client-focused approach to her real estate practice, Holly often acts as in-house counsel for her clients and becomes a trusted member of their businesses. She strives to guide her clients through complex deal transactions with an efficient, direct and collaborative approach that helps them minimize risks through all the stages of owning, leasing, developing and financing real estate. She is highly responsive and able to adeptly and efficiently handle any type of commercial real estate deal. Prior to joining Longleaf Law Partners (formerly Morris Russell Eagle & Worley, PLLC), Holly practiced as a real estate finance attorney at Womble Carlyle Sandridge & Rice. She received her J.D. from Emory Law School with highest distinctions. While at law school, she was a Managing Editor of the Emory Law Journal, and she received the Myron Penn Laughlin Award for overall excellence in legal research and writing. 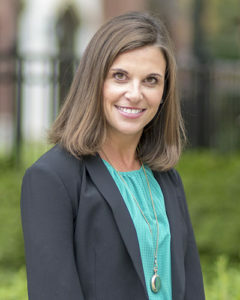 Prior to law school, Holly graduated from the University of Georgia as a First Honor Graduate with a perfect 4.0 GPA, all while serving as the University’s Pan-Hellenic President. When not at work, Holly enjoys spending time with her husband Jay and their two young children, William and Lucy.